Green field with the golden Commonwealth Star on the hoist side and the Southern Cross in white on the fly side. The colours represent the Australian Nation. In the canton sits the seven-pointed Federation Star of Australia. The background of the flag is a dark blue for the oceans that surround the continent and the inky dark skies of its interior. In the top center is the familiar Southern Cross in the Australian style. 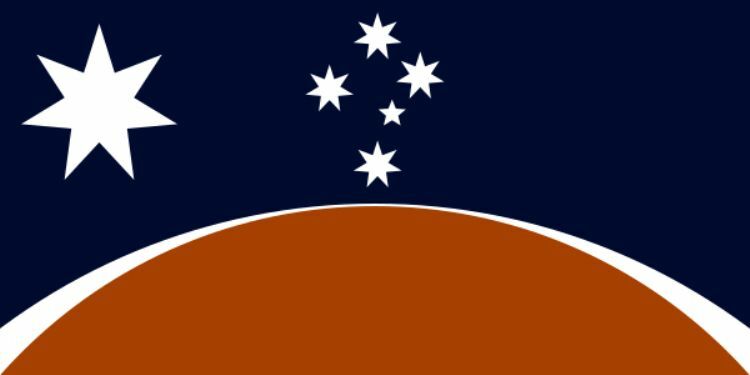 Below the orange fragment of a circle to remind of Uluru and a nod to its Aboriginal people and their flag, but in the color of an earthy orange to represent the colors of the continent, especially the vast interior. A white fimbriation as a fragile border reminds of the precious ecological balance and niche of the continent, and of Australia's desire for peace with other nations. This is an updated and more finished version of previous designs with adjusted colour. The green, gold and blue with white stars. +Star of Federation - 7 points in starlight white representing the Commonwealth of Australia. +Southern Cross or Crux Constellation - 5 stars; 4 crux stars have 7 points and small star has 5 points, in starlight white, constellation of the southern hemisphere by which we can navigate, also indicates islands belonging to Australia. +Kangaroo - iconic Australian native marsupial animal resident mascot featured on the Australian coat of arms, also known as Skippy, who has the Federation Star at heart. 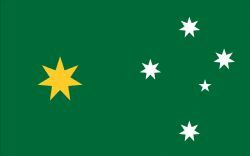 +Heritage Federation Green - representing the native flora of Australia and Australia's federation, the green vegetation on the land, serving as the background for the Federation Star. 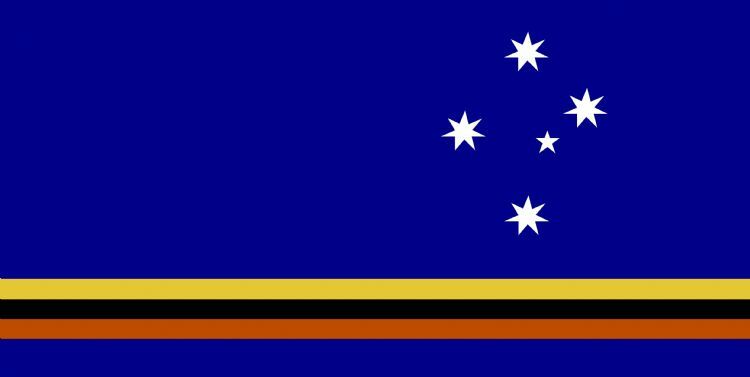 +Deep Royal Blue - representing the sky above us and the sea surrounding our island continent Australia, also honouring the Australian Constitution and the influence of the Commonwealth in guiding our nation. +Sunshine Gold - honouring the sun that provides us light, warmth and energy, honouring the Indigenous people and animals of Australia, also represents the golden sands of our beaches. +Starlight White - honouring the stars by which we navigate. A in deep royal blue representing the sky above us and the sea surrounding our island continent Australia. U in sunshine gold as the top line of the Kangaroo. S in heritage federation green as the background for the Federation Star. T in starlight white as the southern cross or crux constellation. R in sunshine gold in the body of the kangaroo. L in sunshine gold in the body of the Kangaroo. I in sunshine gold as the line from tail tip to foot tip of the Kangaroo. A in royal blue representing the sky above us and the sea surrounding our island continent Australia. The outline of the icons overall loosely has the appearance of the shape of Australia. Skippy could also be balancing on the tail with feet kicking into the air and arms pushed behind for balance if you stare at it for long enough. From left to right, the colours go, land, beach, sea. 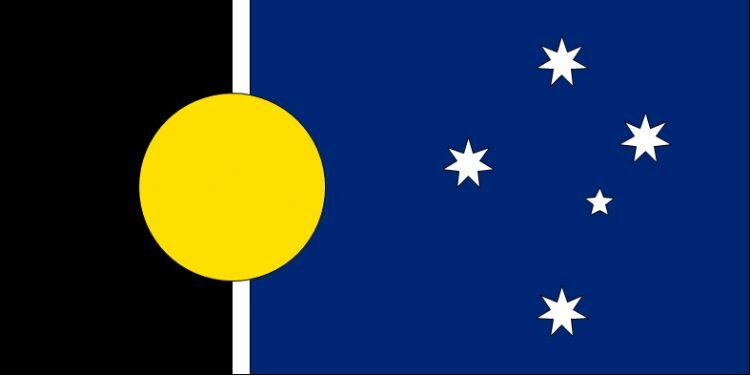 A flag for all Australians. Symbolism: Says Australia simply with appropriate symbols and colours. Retains the current flag’s blue background with white stars. Australia is surrounded by blue oceans plus white surf on our beaches and white heat of the outback. In the upper hoist (canton) of the flag is the white seven pointed Federation Star that represents current states and territories. On the fly are 5 white stars, representing the Southern Cross to signify that we are geographically located in the southern hemisphere. 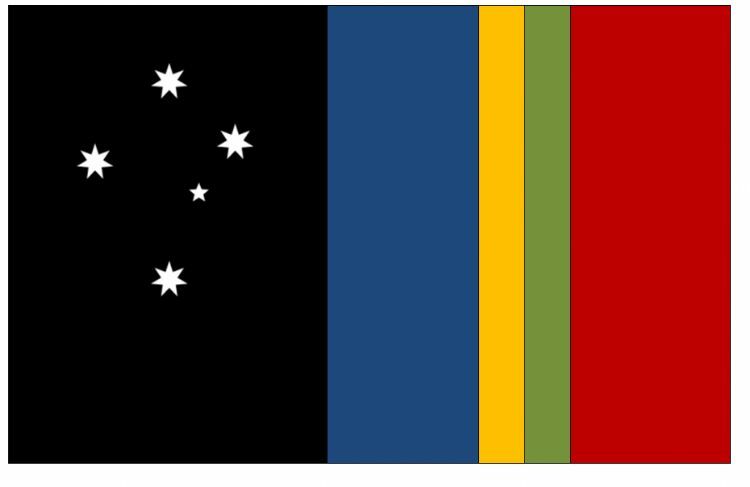 Separating the canon and fly there is a stylised three coloured boomerang crossing both the top and bottom of the flag with the same width of narrowing yellow, green and white boomerang strips and pointing toward the Star of Federation. 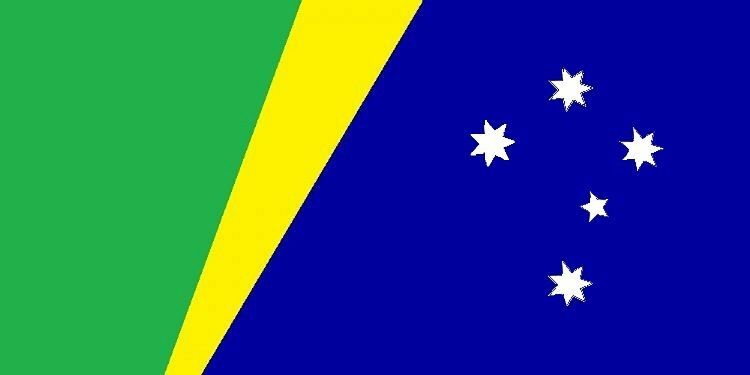 The yellow represents Australia’s golden beaches, golden wattle, deserts and wealth while the green represents the tropical rainforests and vast open grasslands. It also reinforces Green and Gold as our official sporting colours. The final narrow white stripe provides a link to our current flag and also represents the white heat of the outback and white surf on our beaches. A simple and effective design. A centred Southern Cross on a blue field, filling the area to the left of the line that is stretching from the lower midpoint to the upper centre-right. The yellow stripe, stretching from the lower midpoint to the upper-right corner, is covered partially by a green cut-off stripe, which fills the area from the lower centre-right to the upper-right corner. The Southern Cross represents the location of Australia in the Southern Hemisphere. The blue field represents the Pacific Ocean and the means by which the ancestors of the European Settlers came to Australia. The yellow stripe represents the vast desert and the homeland of the Aboriginal peoples. The green stripe represents the fertile plains of our nation. I may be emailed at jordvr@gmail.com for the svg version if necessary, as there is no form to submit it here. An interesting design concept we have not previously seen. The red band at the hoist represents the Australian continent, with the Commonwealth star in the canton. Next to it a white band is included for fimbriation and could also symbolise the beaches of our shoreline and the richness of our people and resources. 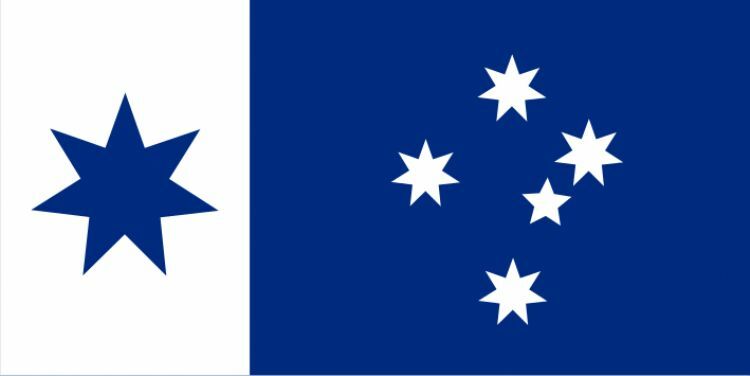 The white Southern Cross on a dark blue background is an iconic symbol of Australia and maintains connection to the existing flag. The red band at the base of the field represents the vast Australian continent. Above it a band of gold symbolises the richness of our people and resources. The dark blue represents the ocean and the sky. The Commonwealth star is in the canton while the Southern Cross, an iconic symbol of Australia, features in the upper part of the field. Similar design to flag #15 in the 1997 Professional Flag design competition, but with the addition of the Commonwealth Star in the canton. revised design of a previous submission. An unusual design, but worthy of selection due to its innovative and striking appearance. The golden kangaroo. What the maple leaf is to Canada so the kangaroo is to Australia. No mistaking this flag on the international stage as to its origin and nationality. A simple and striking design. 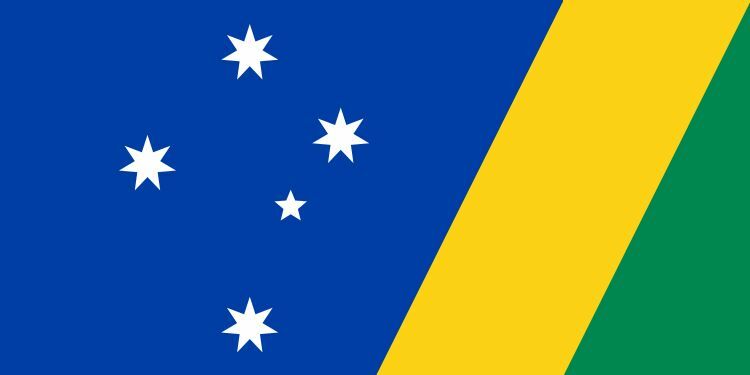 The flag uses the Australian Pale linking it to the flags of the ACT and NT. 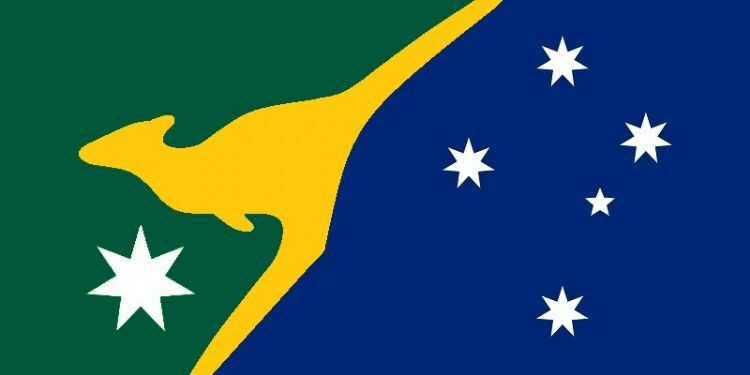 IT uses two elements associated with Australia, the Southern Cross and the Kangaroo. 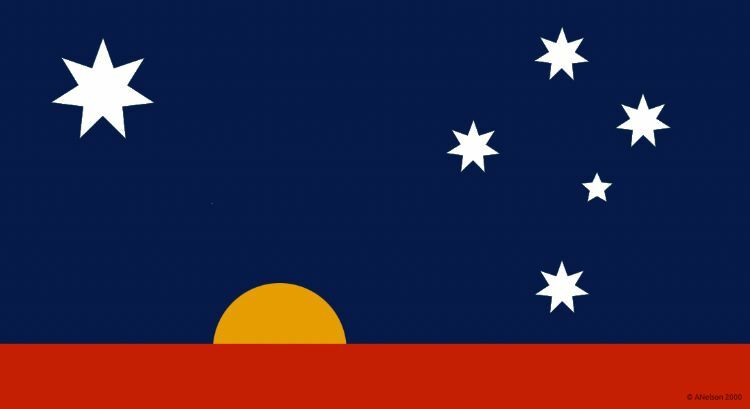 The Southern Cross brings continuity having been visible to the first peoples, guided European settlers and been the distinctive element on the Australian Flag since 1901. The southern cross is portrayed in green and gold in a manner reflective of the national flower the golden wattle. These are also the traditional sporting colours of Australia and represent the land and its riches. Seven pointed stars are used to represent the federation of states. The kangaroo represents progress and Australia's motto: "Advance". The blue field represents the sea on which Australia is reliant for trade. The gold stripe represents the coast. The white of the kangaroo represents the peace in which we seek to live. Another kangaroo design, in the "Australian Pale" style. An evolutionary design, featuring a traditional blue field and silver Southern Cross with a gold kangaroo on the canton. What could be more Australian? Current flag blue background with white stars. In the upper hoist (canton) of the flag is the white seven pointed Star of Federation to represent states and territories. On the fly are 5 white stars, representing the Southern Cross. Yellow and green stripes are set parallel at the bottom of the flag. The yellow represents Australia’s golden beaches and deserts while the green represents the tropical rainforests and vast open grasslands. It also reinforces Green and Gold as our sporting colours. A simple and visually pleasing design. Australian pale with first third white and second two-thirds blue. Blue and white are from the existing flag. 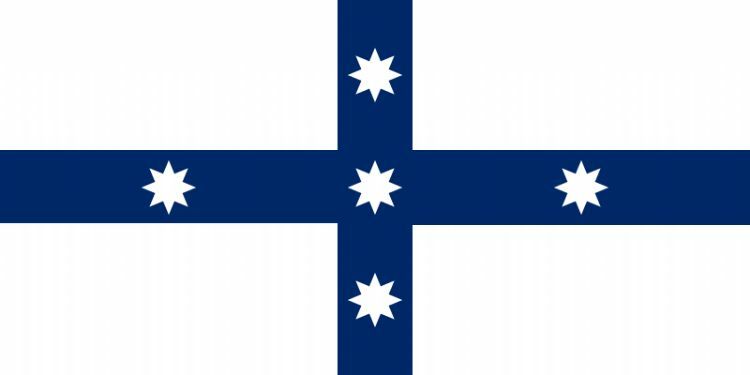 The Southern Cross is retained in the fly, as with the current flag, and the Commonwealth Star is centred in the first third of the flag in the same blue as the second two-thirds. 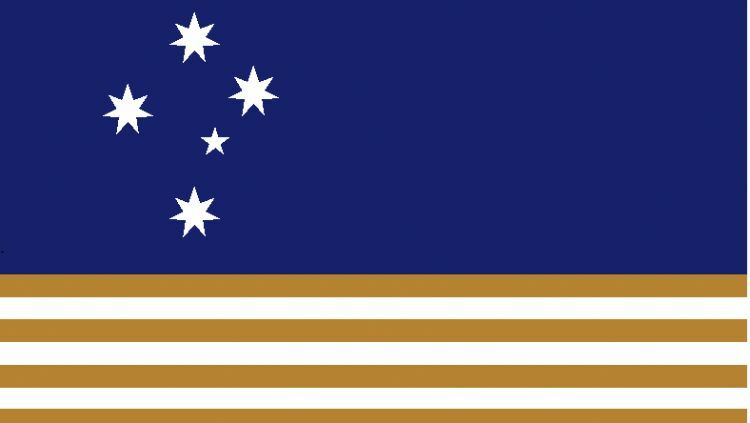 I believe the Commonwealth Star and Southern Cross speak for themselves in what they signify, thus I will not describe the symbols themselves. A simple design based on the "Australian Pale" or vertical division of the field of the flag into a one-third / two-thirds split. My flag design is a combination of elements that honour those people, cultures and symbols that brought us to where we are today. One people within one land. An interesting merging of symbolism. Same dimensions as NT flag. Southern cross on a blue background. Gold federation star on a green background. 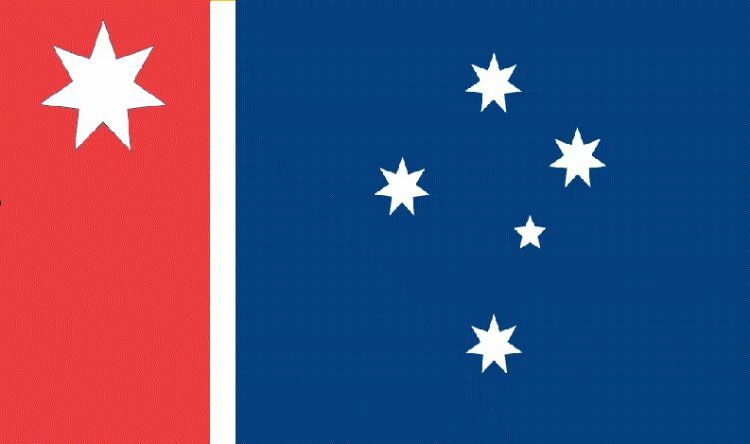 A simple design based on the "Australian Pale" or vertical division of the field of the flag into two one-thirds width / two-thirds width panels. A 'new' take on an old idea - this is essentially the proposed Federation Flag of 1867, minus the Union Flag in the canton. 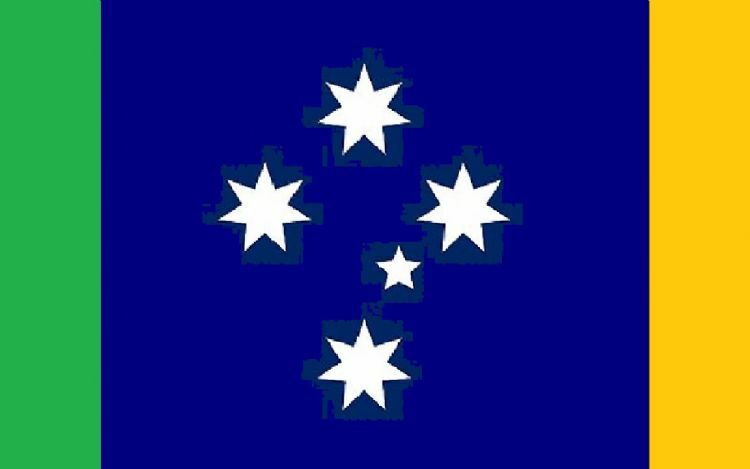 The arrangement of the stars on that flag was inspired by the Eureka Flag of 1854. The Federation Flag achieved considerable popularity in the 1890s. Although people are often terrified of seeing the kangaroo on a potential national flag, it is without doubt the icon that most people in Australia and Overseas consider to be quintessentially Australian. 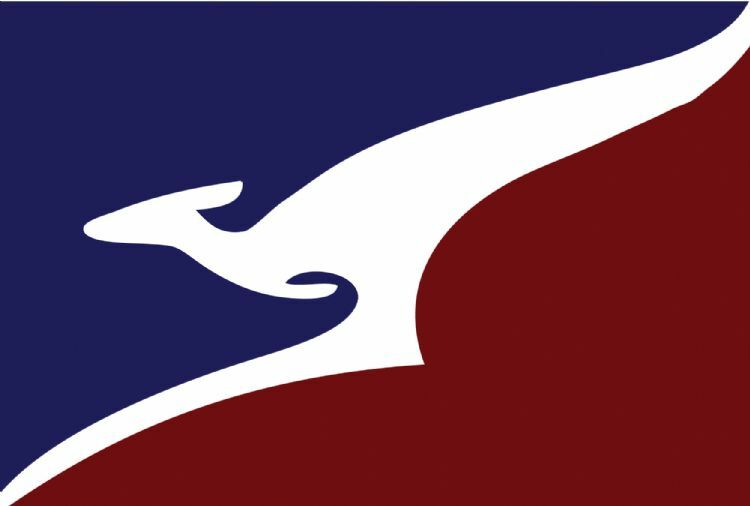 Taking a stylised outline of our "national kangaroo" from Qantas, the image jumps over the red ochre of our ground against the blue of our sky. A highly stylised and exaggerated kangaroo design. Because this is based on the Qantas logo, it may trigger trademark concerns, or be accused of being a "logo flag". The stripes represent the federation. The colour gold represents the nations wealth in its people and resources.. 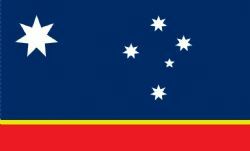 This style of design is also frequently submitted to Ausflag - the southern cross on a blue field in the upper part of the flag, with one or more horizontal stripes in the lower third or quarter. For example, see designs #001, #015, #037, #046, #056, #064, #065 and #071 in the Professional Designers Competition of 1997. 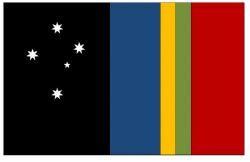 The Southern Cross on Dark Blue background signifies our place in the world,and retains the best Symbol Australia has. This is also to keep consistency with our old flag that served us well up until now. The Boomerang of Gold is rotating Forward - advancing us - and can be seen as coming back to our core values, and utilizes an indigenous symbol we can ALL relate to. The boomerang is also recognizable throughout the world as a unique Australian object/symbol. The Federation Star is also an important symbol recognizing the 6 States and Territories. Green is added on the back or behind the FS to ensure our National colours are represented in a high priority portion of our Flag. A graphically pleasing and simple design. 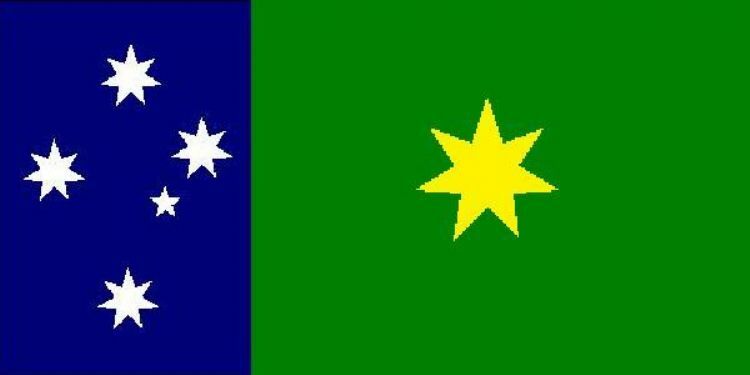 While similar in concept to designs previously submitted to Ausflag (e.g. Designs #048 and #066 in the Professional Designers Competition) we consider this a superior execution of the concept. Red is for outback/desert. Green for forest and coast. Gold for beach sand and soil (also sporting colors). Blue for ocean. Black for sky and space with Southern Cross. 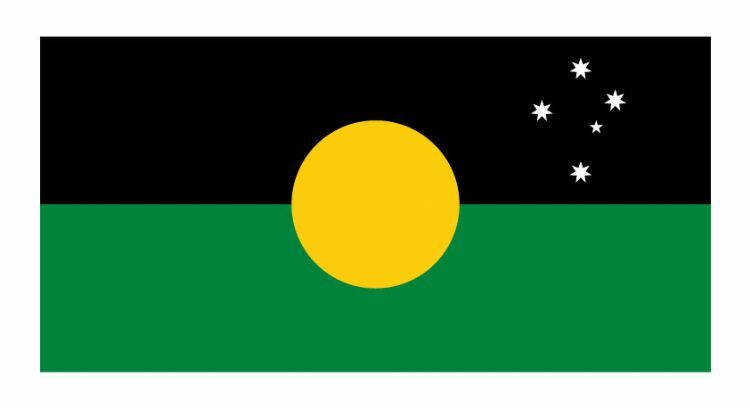 Design also expresses elements of current Australian flag and aboriginal flag. Another simple design which mostly respects the principles of good flag design except that the red and green stripes abut each other, causing a colour clash. This is strongly discouraged in flag design, and is heraldically improper. This is an evolution of our existing flag featuring the most recognised symbol of Australia – our unique Kangaroo. 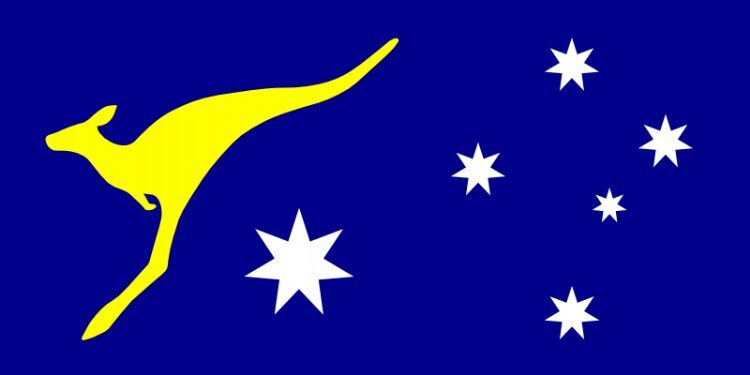 For various State flags the federation star could be replaced with their state symbols as happens now on their present flags. 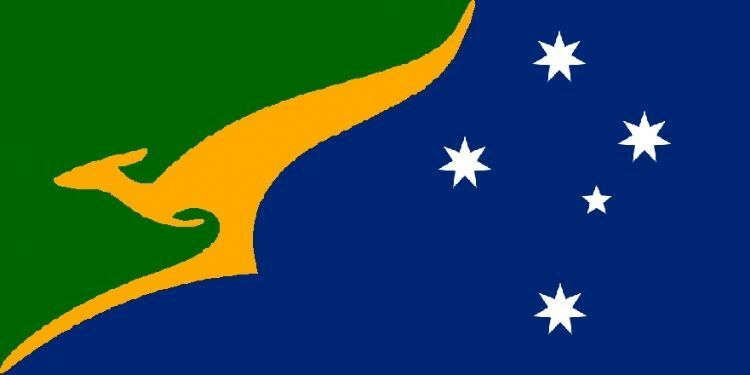 The most iconic symbol that is instantly recognised around the world as Australian is out unique kangaroo, it is used by airlines, trade marks, logos etc, so why not also on our national flag? Kangaroos are a common feature of designs submitted to Ausflag. While undeniably Australian, many think that a flag containing an image of a kangaroo would not have sufficient 'gravitas' to be a national flag. In an opinion poll conducted by AGB-McNair in 1995, only 18% of respondents indicated that they thought a kangaroo would be the most appropriate symbol on a new Australian flag. 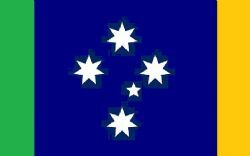 The white Southern Cross on blue, as well as existing dimensions, is retained as it is strongly identified by Australians as a national symbol. Add is the gold disc which is suggestive of the significance of indigenous Australians and the country they have long been guardians of. The 'Sun' is also appropriate as a national symbol. It symbolises the 'Sunburnt Country' as well as being a bold, optimistic and uplifting form that looks boldly and confidently to the future. The yellow disc also represents the wattle flower which has had a longstanding status as a national symbol. Yellow (or gold) is also a colour that has commonly been used a colour that identifies Australians internationally. The Black panel and White trim provide some structure to the flag and can be seen to represent a chronology of the country, where there has been a long aboriginal guardianship with a more recent European involvement in building the nation. Together, with optimism and confidence we take the nation into the 'blue sky' of possibilities. Graphically simple design which reflects the principles of good flagcraft. Similar to design #047 in the Professional Designers Competition of 1997. The Federation Star has replaced the British Union Jack. The seven pointed star represents the 6 states and Northern Territory. The sun and earth and sky represent the Aboriginal first peoples of Australia. The Southern Cross constellation can only be fully seen in the Southern Hemisphere.